Vulcan, Inc. is an employee-owned company located on the Alabama Gulf Coast in Foley. 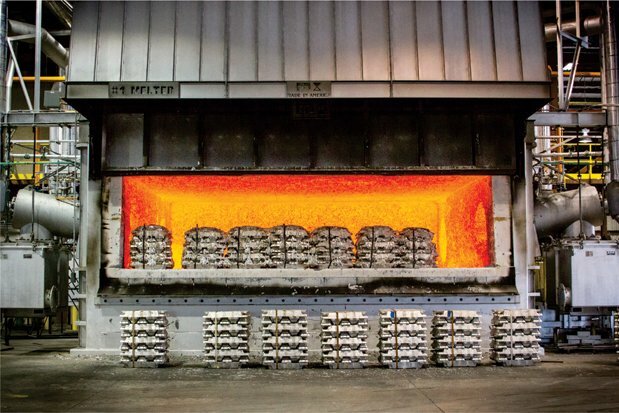 The firm operates one of the only completely vertically integrated aluminum processing plants in the country, in which raw aluminum bars are heated into a molten form, then rolled into coils. The project included the addition of a state-of-the-art, 24,000 sq. ft. building to the existing facility as well as installing a new Annealing Furnace, Water Cooling System and Melting Furnace, which raised production capacity to 110 million pounds per year. Modifications to the Mill and mill-associated equipment were also performed to enhance speed and efficiency. There were 227 construction jobs created in the course of this expansion. The expanded plant employs an additional 22 full-time employees in addition to the existing 275 existing employees. All employees have generous health coverage, employer paid life insurance as well as participate in the company’s ESOP program that provides 100% employee paid deferred income benefits. Vulcan has also added employees to its sales and supervisory staff. The Vulcan plant expansion derived a crucial benefit from the New Markets Tax Credit financing. A $22.5 million Federal allocation was paired with a $10 million Alabama state allocation, generating a subsidy enabling Vulcan to upgrade the equipment purchases for the expanded plant. This has given the facility cutting-edge capabilities, engendering greater employment opportunities and operational success in the long-run. Economic: The company is one of the largest employers in Foley, and this expansion solidifies their standing in both their industry and their community. Jobs: This project created 22 new full time production positions and 227 construction jobs. More importantly, in a difficult commodity environment, the technological advantage Vulcan now enjoys provides additional security for the 275 existing employees. Community: Vulcan, Inc., is an active partner and participates in a variety of economic development initiatives and community events in Foley and Baldwin County. Vulcan Scholarships, Inc. is a private, nonprofit foundation fully funded by Vulcan, Inc., which is headquartered in Foley, Alabama. Since 1985 the Foundation has awarded 90 scholarships with a total value in excess of $500,000. Workforce Development: The company regularly works with South Baldwin County High School and has an internship program through which several full time employees have been hired. Additionally, Vulcan hosts an annual “Manufacturing Day” event in October where 120 high school students are onsite to tour facilities and discuss future job opportunities.